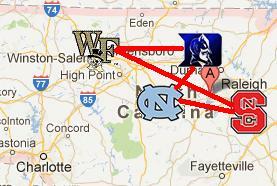 Around here, the term Tobacco Road is just another way to talk about basketball. It’s a shorthand way for locals and diehards to refer to the mighty Atlantic Coast Conference and its four major North Carolina universities: Duke, Wake Forest, North Carolina State University, and the University of North Carolina at Chapel Hill. And who can deny the powerhouse supremacy of the storied teams that make Tobacco Road the stuff of legend? But just how did a term that sounds more like an old farming path come to be synonymous with college basketball in North Carolina? It all started with a trashy novel and a whole lot of tobacco. 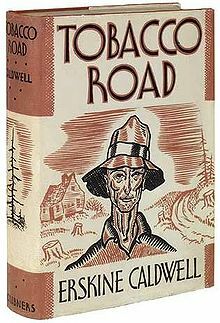 Best I can tell, the first mention of Tobacco Road comes from the 1932 Erskine Caldwell book titled–you guessed it–Tobacco Road. Interestingly enough, the book has nothing to do with basketball or North Carolina. It doesn’t even paint a favorable picture of life in the South. I’m not recommending the book. Location, Location, Location: These days when we talk about Tobacco Road what we mean is the heart of North Carolina–as a region of the state’s geography for sure and maybe, just maybe, as a fair-to-middling piece of its soul as well. When applied to North Carolina basketball, Tobacco Road is not really so much a road as it is a general location or a sort of rallying esprit de corps for fans throughout the Old North State in general. Plainly, there is no actual street named “Tobacco Road” that connects the state’s universities (and their basketball programs). That said, however, over time Tobacco Road has been used with reference to at least 3 different real-life thoroughfares: old Highway 70; U.S. Route 15-501; and, today, the 108-mile east-to-west stretch of I-40 between Raleigh and Winston-Salem. The North Carolina universities referred to as the Big Four are called such because there are four of them and they are big–not just in size but also in history and athletic prowess. And it just so happens that the Big Four all reside in the area of North Carolina known as the Piedmont–that is, the foothills, the middle part of the state with its 200 miles of rolling terrain between the mountains and the coast. And the area that has seen most of the state’s farming and manufacturing. In fact, it was Piedmont’s dual dominance in both agriculture and industry that gave rise over time to the “Big Tobacco” business that has long defined the state’s commerce. Big Tobacco: Although this country’s first tobacco was grown in Virginia in the early 1600s, it really took hold in the North Carolina soil, especially in the Piedmont. First introduced to North Carolina sometime between the Lost Colony (1587) and the signing of the Declaration of Independence (1776), tobacco has been a staple in North Carolina’s economy for pretty much its whole statehood. I-40 runs east to west right smack through the middle of the state–and indeed, clear across the country as well. 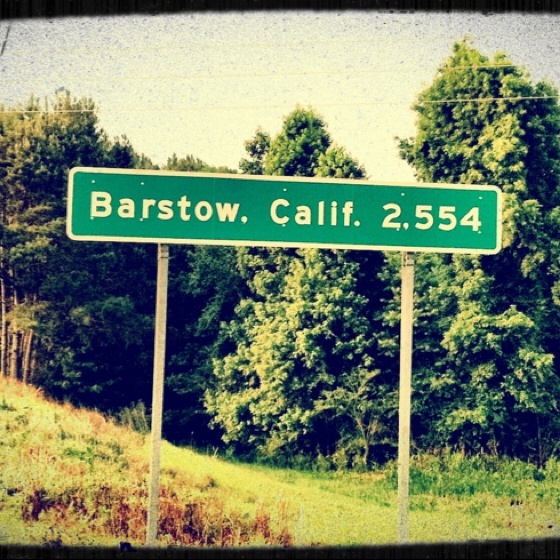 In fact, where the road begins in the North Carolina city of Wilmington (hometown of basketball great Michael Jordan, formerly of UNC-CH) is a road sign stating the mileage to Barstow, California, the end of the line–2,554 miles, to be precise. 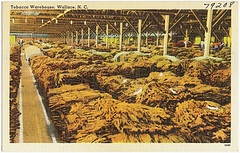 The monopoly of the industry by the American Tobacco (as organized by James B. Duke, who disassociated himself from the industry and later financed the founding of Duke University) led to the Supreme Court order in 1911 to dissolve the corporation into six subsidiaries, including Philip Morris, Brown and Williamson, and R.J. Reynolds. In spite of its decline due to health concerns, economic issues, and societal trends, the North Carolina tobacco industry still remains a top world producer. Dennis, Brady. “Basketball Road: The Story of ACC Basketball.” Our State. July 2012. Web. 19 Mar. 2015.